Hair loss is a condition that affects millions of men, with millions of others worrying that someday it will affect them. Though this condition is widespread, the knowledge about it isn’t: in fact, much confusion exists on how to fight the battle of the bald. According to US News, two out of three men will be balding by the time they reach their 60s (though some may be fully bald decades earlier). The amount of money spent on hair restoration helps prove that hair loss is of a major concern: American males spend $1 billion every year trying to keep their curls. There are many myths surrounding male pattern baldness and hair loss. The following are among the most common untruths: men who are most sexually active are more likely to go bald; exposure to the sun or tanning beds accelerates hair loss; and shampoo, hair spray, mousse and hair gel all lead to balding. Another myth is that wearing hats and visors can lead to hair loss. While this isn’t true, wearing hats filled with germs or bacteria can lead to scalp inflammation or infection, two things that can cause hair follicles to die. The idea that the genetics of hair loss are passed down on the mother’s side isn’t really a myth, but it’s not entirely true, either. Primary baldness does reside on the X chromosome (which men receive from their mothers), but research has shown that men with bald or balding fathers are also more likely to have a receding hair line. According to the University of Chicago, the vast majority of hair (around 90 percent) grows continually on the scalp. The remaining 10 percent stays in a resting phase for two to three months. When this stage is over, that hair is shed. Whenever hair is shed (usually 50 to 100 hairs per day), it is replaced by new hair from the same follicle. As people age, hair growth is slower. This is why age is a major factor in baldness. Other things that cause baldness include a change in hormones (which also happens with age), illness, familial history of baldness, burns, trauma and rapid or drastic fluctuations in weight. While science has worked for years to find a pill, gel or serum to curb baldness once and for all, no quick fix has been discovered as of yet. But all hope (or all hair!) is not lost! Hair restoration surgery, as the Mayo Clinic discusses, can help people, particularly those who have some of their own hair remaining. The most common types of surgical procedures include hair transplants (usually with your own hair) and scalp reduction surgery that physically removes a portion of the bald skin on your head. For those concerned about baldness, some preventative measures may be helpful. 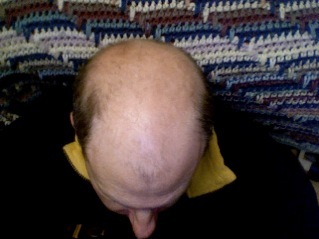 According to Fox News, baldness may be avoided by eating a diet rich in fish (omega-3 fatty acids and vitamin D may help prevent hair loss), maintaining adequate iron levels, taking a vitamin B supplement, reading the labels on prescription drugs (certain ones, such as arthritis medications and blood thinners, can cause hair loss) and practicing good personal hygiene (regular shampooing can help avoid fungal infections, which can lead to hair loss). Sometimes, no matter the actions taken, baldness will happen. But knowing the fact from fiction can help you avoid, at the very least, pulling your hair out in frustration! This article was provided by Mike Gordon, recent college graduate and hair-conscious bachelor. If you’re balding or want to look into preventative measures, Mike suggests researching hair loss treatment for men.